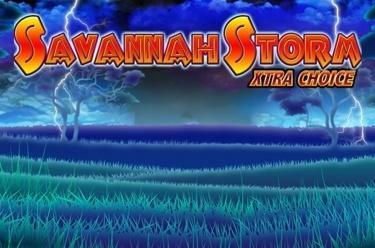 Play Savannah Storm Xtra Choice online for free now! Pull out your binoculars, stay very calm and watch the exotic wildlife of the African savannah from a distance: buffalos, lions and elephants. Suddenly clouds appear at the sky, a lightning flash illuminates the scene and it starts to rain Twists! 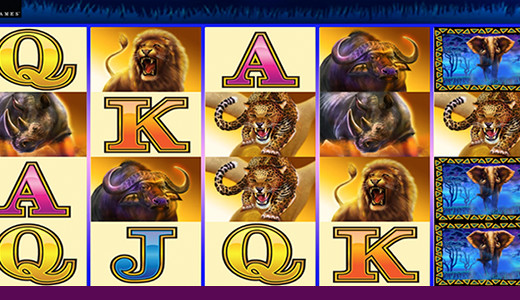 Savannah Storm Xtra Choice excites with its magnificent settings as well as its splendid winning chances: You decide whether you play with or without fixed win lines and you can select the free game that you fancy the most. The Twist hunt is now open! The aim of your winning safari is 5 identical symbols. You can choose between 2 game options in Savannah Storm Xtra Choice: You either play on up to 25 fixed win lines or you opt for the 1024-Winning-Path-Variant with no fixed lines. With the latter identical symbols only have to fall onto directly adjacent reels without occupying particular positions. In both versions the winning patterns start on the first reel and run across the remaining reel set to the right. Your hunt for Twists is accompanied by 2 Bonus symbols: The Diamond is the Joker symbol that only lands on reels 2, 3 and 4 and substitutes for all symbols except Scatter. 3 to 5 Scatter (Trees) in any position on the reels not only pay a win but also trigger Free Games! This Free Game Variant with 15 rounds is triggered when you play with fixed lines and 3, 4 or 5 Scatter (Trees) land in any position on the reels. With some luck the feature might be started randomly after a spin. During the Free Games every Diamond in a winning combo doubles or quadruples a line win. You can win more Free Games with 3 to 5 Scatter or randomly at the end of a spin! This Free Game Feature is triggered when you have selected the 1024-Win-Line-Variant (no fixed win lines) and 3, 4 or 5 Scatter appear in any position on the reels. The feature can also start randomly following a spin if Lady Luck is on your side. 10 Free Games: Every Diamond in a winning combo pays triple or quadruple wins. 14 Free Games: Every Diamond in a winning combo pays double or quadruple wins. 18 Free Games: Every Diamond in a winning combo pays double or triple wins. 22 Free Games: Every Diamond in a winning combo pays double wins. Mystery-Choice-Free-Games: One game variant is selected randomly from the above-mentioned. During the Free Games you can win further Free Games with 3 to 5 Scatter or randomly following a spin.